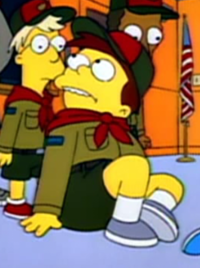 A Junior Camper was a member of Ned Flanders' patrol of Junior Campers. He was instructed to breathe into Bart's mouth every few minutes by Ned after Bart fell unconscious at a Junior Campers meeting. After Bart threw him off, he asked Ned if he should keep doing it, while Bart coughed and spat. Later, when Ned instructed the group to take out their pocket knifes, the boy did, only to have Bart come along and take the knife, or 'spork' in admiration, while he cowered and asked him to not hurt him. It is unknown whether the boy died during an attack when in the woods whilst on a father and son rafting trip.